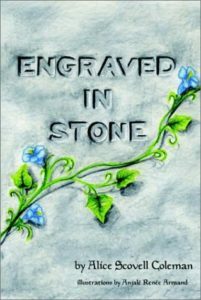 Princess Elizabeth of Graycliff and Prince Edward of Whitehill have been bound to marry each other by the terms of a magical stone engraving. If they do not marry by their sixteenth birthday-only six days away-they will turn to stone. Serious Elizabeth loves eloquent poetry, somber music, and courtly dancing. Playful Edward loves athletic competition, nature’s beauty, and peasant food. They meet right before the wedding and discover that they detest each other. With the clock ticking, Elizabeth and Edward decide to travel to distant Engravia to find a stonecutter who, they hope, will release them from the dreadful enchantment. They begin their journey convinced that the greatest hardship will be spending time together. Little do they know that traps lie in wait for them, for each kingdom they visit offers a temptation which threatens to hold them…forever.